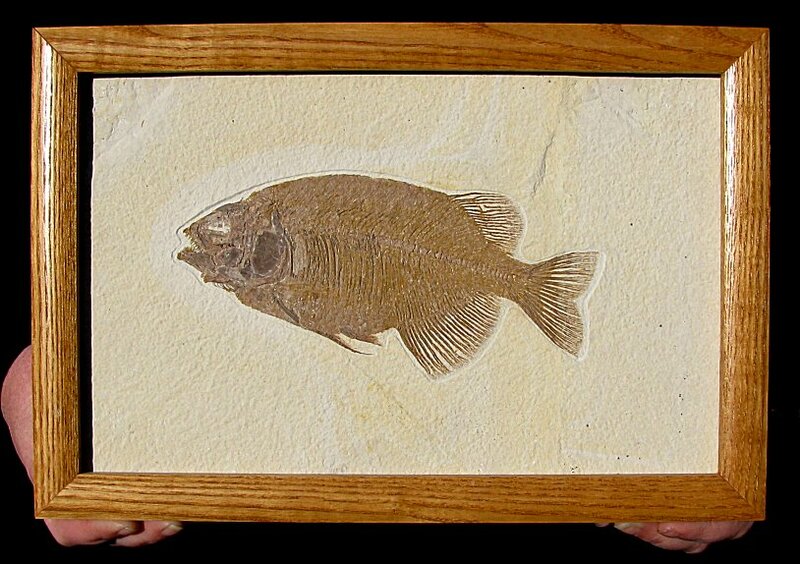 Size: Fish is 7.2", frame is 8.6" X 12.9"
This is a beautiful display fossil. 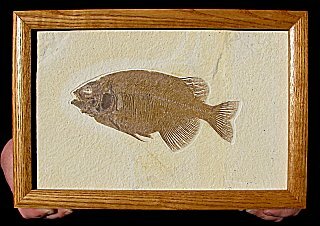 It is a top quality Phareodus testis fossil fish from the Green River Formation of Wyoming. Phareodus was a predatory fish, with a mouth FULL of sharp teeth - this specimen showcases these LONG teeth beautifully. The fish is extremely well-preserved and displays extremely fine detail. The many fins and broad tail are simply awesome - very complete and symmetrical. The head is just awesome, and the large gill plate is even preserved on this specimen. The fish is well showcased on a large, rectangular matrix plate. And this amazing fish has been professionally framed for optimal display - WOW! This is a textbook example of a Phareodus fish, easily one of the best we have ever had!